Researchers at the Georgia Institute of Technology have developed a new class of electronic logic device in which current is switched by an electric field generated by the application of mechanical strain to zinc oxide nanowires. The devices, which include transistors and diodes, could be used in nanometer-scale robotics, nano-electromechanical systems (NEMS), micro-electromechanical systems (MEMS) and microfluidic devices. The mechanical action used to initiate the strain could be as simple as pushing a button, or be created by the flow of a liquid, stretching of muscles or the movement of a robotic component. In traditional field-effect transistors, an electrical field switches -- or "gates" -- the flow of electrical current through a semiconductor. Instead of using an electrical signal, the new logic devices create the switching field by mechanically deforming zinc oxide nanowires. The deformation creates strain in the nanowires, generating an electric field through the piezoelectric effect -- which creates electrical charge in certain crystalline materials when they are subjected to mechanical strain. "When we apply a strain to a nanowire placed across two metal electrodes, we create a field, which is strong enough to serve as the gating voltage," said Zhong Lin Wang, a Regents professor in the Georgia Tech School of Materials Science and Engineering. "This type of device would allow mechanical action to be interfaced with electronics, and could be the basis for a new form of logic device that uses the piezoelectric potential in place of a gate voltage." Wang, who has published a series of articles on the devices in such journals as Nano Letters, Advanced Materials and Applied Physics Letters, calls this new class of nanometer-scale device "piezotronics" because they use piezoelectric potential to tune and gate the charge transport process in semiconductors. The devices rely on the unique properties of zinc oxide nanostructures, which are both semiconducting and piezoelectric. The transistors and diodes add to the family of nanodevices developed by Wang and his research team, and could be combined into systems in which all components are based on the same zinc oxide material. The researchers have previously announced development of nanometer-scale generators that produce a voltage by converting mechanical motion from the environment, and nanowire sensors for measuring pH and detecting ultraviolet light. "The family of devices we have developed can be joined together to create self-powered, autonomous and intelligent nanoscale systems," Wang said. "We can create complex systems totally based on zinc oxide nanowires that have memory, processing, and sensing capabilities powered by electrical energy scavenged from the environment." Using strain-gated transistors fabricated on a flexible polymer substrate, the researchers have demonstrated basic logic operations -- including NOR, XOR and NAND gates and multiplexer/demultiplexer functions -- by simply applying different types of strain to the zinc oxide nanowires. 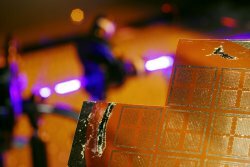 They have also created an inverter by placing strain-gated transistors on both sides of a flexible substrate. "Using the strain-gated transistor as a building block, we can build complicated logic," Wang added. "This is the first time that a mechanical action has been used to create a logic operation." A strain-gated transistor is made of a single zinc oxide nanowire with its two ends -- the source and drain electrodes -- fixed to a polymer substrate by metal contacts. Flexing the devices reverses their polarity as the strain changes from compressive to tensile on opposite sides. The devices operate at low frequencies -- the kind created by human interaction and the ambient environment -- and would not challenge traditional CMOS transistors for speed in conventional applications. The devices respond to very small mechanical forces, Wang noted. The Georgia Tech group has also learned to control conductivity in zinc oxide nanodevices using laser emissions that take advantage of the unique photo-excitation properties of the material. When ultraviolet light from a laser strikes a metal contact attached to a zinc oxide structure, it creates electron-hole pairs which change the height of the Schottky barrier at the zinc oxide-metal contact. These conductivity-changing characteristics of the laser emissions can be used in tandem with alterations in mechanical strain to provide more precise control over the conducting capabilities of a device. "The laser improves the conductivity of the structure," Wang noted. "The laser effect is in contrast to the piezoelectric effect. The laser effect reduces the barrier height, while the piezoelectric effect increases the barrier height." Wang has called these new devices fabricated by coupling piezoelectric, photon excitation and semiconductor properties "piezo-phototronic" devices. The research group has also created hybrid logic devices that use zinc oxide nanowires to control current moving through single-walled carbon nanotubes. The nanotubes, which were produced by researchers at Duke University, can be either p-type or n-type. The research has been supported by the National Science Foundation (NSF), the Defense Advanced Research Projects Agency (DARPA), and the U.S. Department of Energy (DOE). In addition to Wang, the research team includes Wenzhuo Wu, Yaguang Wei, Youfan Hu, Weihua Liu, Minbaek Lee, Yan Zhang, Yanling Chang, Shu Xiang, Lei Ding, Jie Liu and Robert Snyder. "Our work with strain-gated devices provides a new approach to logic operations that performs mechanical-electrical actions in one structural unit using a single material," Wang noted. "These transistors could provide new processing and memory capabilities in very small and portable devices."